Get to know Dr. Ramirez and become part of the family. Dr. Ramirez is a diplomat of the American Board of Plastic Surgery, which means he has completed the necessary years of training and passed the qualifying examination to be certified as specialist in plastic surgery. He holds academic appointments as a Clinical Assistant Professor at the Johns Hopkins University School of Medicine and the University of Maryland School of Medicine. Dr. Ramirez is an internationally acclaimed plastic surgeon known for his innovative surgical techniques in reconstructive and cosmetic surgery, particularly, endoscopic plastic surgery. He is an international speaker on advanced plastic surgery techniques. Dr. Ramirez has more than 18 years of experience in the field. He has been featured in many important newspapers and magazines such as Allure, Prevention, U.S. News, The Baltimore Sun, Warfield Business Record, Towson TImes, Votre Beaute (France), Der Spiegel (Germany). He has been interviewed by television stations in Germany, Japan, Australia, Brazil and the United States. Dr. Ramirez has been a visiting professor at many university centers in the USA, Asia, Europe and South America. He has been actively involved in research and teaching other plastic surgeons in his private center formerly in Baltimore (Timonium, “Esthétique Internationale”) and now practicing at “Ramirez Plastic Surgery” at the Elite Center for Cosmetic Surgery in Weston, Florida. Doctor Ramirez gives surgical demonstrations to other plastic surgeons around the world. Dr. Ramirez has authored over one hundred articles, a number of textbooks on aesthetic surgery and endoscopic surgical techniques, as well as serving as a contributing author for an additional twenty medical textbooks. In 2004, Dr. Ramirez was named one of 2,000 Outstanding Scientists of the 21st Century for his contribution to science in the area of plastic and reconstructive surgery, by the International Biographical Centre in Cambridge, England. Dr. Ramirez is a member of the following societies: The American Society for Aesthetic Plastic Surgery, American Society of Plastic and Reconstructive Surgeons, International Society of Aesthetic Plastic Surgery, Rhinoplasty Society (Founding Member), Lipoplasty Society of North America, American Society for Laser Medicine and Surgery, Inc., The Society of Laparoendoscopic Surgeons (SLS), John Staige Davis Society, Baltimore County Medical Society, Medical and Chirurgical Faculty of the State of Maryland, Johns Hopkins Medical and Surgical Association, Iberolatinamerican Society of Plastic & Reconstructive Surgery, AAAASF, and AMA. I had two rhinoplasty procedures with awful results from another plastic surgeon. I was told about Dr. Ramirez and am delighted by the results. Dr. Ramirez's surgical team is composed of a Board Certified MD Anesthesiologist, Surgical Assistants who are doctors from South America and are Certified as Surgical Assistants, and Certified Scrub Techs. 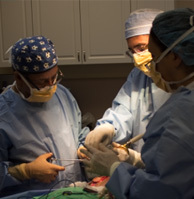 Dr. Ramirez performs very technical operations and his team provides the necessary support. Teamwork is not only at the time of surgery; but starts from the very first time you step into the office. Dr. Ramirez's staff is friendly and make sure that you are comfortable at every step of your procedure...from booking a consultation to your final checkup. As more and more people integrate plastic surgery into their lifestyles, it is not unusual for our patients to return for many procedures throughout their lives. We believe that cosmetic surgery is an individual choice. It is about helping you to feel better about yourself. We provide a wide range of cosmetic surgery procedures to service your personal needs. We have several different medical providers that are skilled in different cosmetic surgery and plastic surgery procedures. Not too little and not too much, Dr. Ramirez's Anesthesiologist is a Board Certified MD. There are a variety of anesthetics that are available from local, to twilight, to IV Sedation, and more. The exact kind will depend upon the patient's request and complexity of the procedure. Patients are fond of saying that they went to sleep gently before their procedure and woke up with little or no side effects from the anesthesia administered. Dr. Ramirez also makes sure that you are not going to be in any pain as a result of your surgery. Therefore he will prescribe the right amounts of painkiller for you as needed. Dr. Ramirez is an internationally renown plastic surgeon who's opinions are sought by other doctors around the world. He is a speaker at several international conferences throughout the year. He has been featured in many important newspapers and magazines such as Allure, Prevention, U.S. News, The Baltimore Sun, Warfield Business Record, Towson TImes, Votre Beaute (France), Der Spiegel (Germany). In addition, he has been interviewed by television stations in Germany, Japan, Australia, Brazil and the United States. Ramirez, O.M. : Hemovac Drainage for Optimal Wound Healing at Operative Site with Split-Thickness Skin Graft. In Wesley, R.E., ea. : Techniques in Ophthalmic Plastic Surgery. Wiley Medical Publications, N.Y., Ch. 6, 1986. (Entrance No. 14 bibliography). Ramirez, O.M. : The Sliding Gluteus Maximus Flap for Coverage of Lower Trunk Midline Defects. Strauch, Vasconez, Findlay, ed. In: Grabb's Encyclopedia of Flaps. Little, Brown & Co., Boston, 1990. (Entrance No. 24 bibliography) Ramasastry, S.S., Ramirez, O.M. : Bilateral Interconnected Latissimus Dorsi - Gluteus Maximus Musculocutaneous Flaps for Closure of Large Lumbosacral Meningomyelocele Defects. Strauch, Vasconez, Findlay, ed. In: Grabb's Encyclopedia of Flaps. Little, Brown & Co., Boston, 1990. (Entrancer o. 25 bibliography). Ramirez, O.M., Fuente del Campo, A.: Six Volume of the Plastic Surgery Educational Foundation's Instructional Courses. Mosby-Year Book. Subperiosteal Brow Face-Lifting. Mosby Year Book, Inc., St. Louis, MI, 1993. (Entrance No. 48 bibliography). Ramirez, O.M. : Facial Rejuvenation: Subperiosteal Facelift. Mastery of Plastic and Reconstructive Surgery. Little, Brown and Company. Mimis Cohen, MD, Editor. Vol III 1910: 1919, 1994. (Entrance No. 69 bibliography). Ramirez, O.M. : Endoface-Lift: Subperiosteal Approach. Endoscopic Plastic Surgery, Springer Verlag, New York. Oscar M. Ramirez, MD, Rollin Daniel, MD Editors, Chapter 14: 109-126, 1996. (Entrance No. 83 bibliography). Ramirez, O.M., Fuente del Campo, A.: Aesthetic Surgery of the Latin American Male Patient. Granick, M.S., Solomon M.P., Marchac, D., Editors in Aesthetic Surgery of the Male Patient, 1996. (Entrance No. 76 bibliography). Ramirez, O.M. : Subperiosteal Facelift. Granick, M.S., Solomon, M.P., Marchac D., Editors in Male Aesthetic Surgery. Butterworth-Heinemann, Newton, MA, 121:133, 1996. (Entrance No. 77 bibliography). Ramirez, O.M. : Retalhos Fasciais, Fascio-Cutaneos E Osteo-Fascio-Cutaneos. Robert Jan Bloch, Editor. Fascial Cutaneous Flaps of the Posterior Thigh. In press. (Entrance No.47 bibliography). Ramirez, O.M. : L'Approccio Subperiosteo Esteso Lungo La Fascia Profonda Per il Ringiovanimento Facciale. Chirurgia Estetica: Stategia Preoperatorie Techinique chirurgiche. Unione Tipograf~co-Editrice Torinese, F. Ferrari / I. Pitanguy, Editors, Vol primo:195-203, 1997. (Entrance No. 96 bibliography). Ramirez, O.M. : Ethnic Considerations in Facial Aesthetic Surgery. W. Earls Madeira, Jr., M.D., Editor. Facial Surgery in the Hispano-American Patient. Lippincott-Raven, Philadelphia, PA, 307:320, 1997. (Entrance No. 91 bibliography) Ramirez, O.M., Acosta, R.: Lesiones de la Mano. Trauma. Sociedad Panamericana de Trauma (Talleres Graficos de Impresora Ferica, S.A.), Aurelio Rodriguez, MD, Ricardo Ferrada, MD, Editors. 509-533, 1997. (entrance Not 98 bibliography). Ramirez, O.M., Eshbaugh, Jr., W.G. : Endoscopic Surgery. Plastic Surgery Secrets. Hanley & Belfus, Inc., Philadelphia, 329:331, 1998. (entrance Not 95 bibliography). Ramirez, O.M., J.N. Pozner: Sliding Gluteus Maximus Flap, Grabb's Encyclopedia of Flaps, Second Edition. Lippincott - Raven. Vol III, Chapter 411, 1619: 1624, 1998. (Entrance No. 96 bibliography). Dascombe, W.H., Liang, Marc D., Ramirez, O.M. : Rhinoplasty in Infants and Children. Pediatric Plastic Surgery, Appleton & Lange. Michael L. Bentz, M.D., Editor, Chapter 22:529541, 1998. (Entrance No. 105 bibliography). Ramirez, O.M. : Subperiosteal Endoscopic Techniques in Facial Rejuvenation, Plastic Surgery Indications, Operations, Outcomes. Aesthetic Surgery Volume, Editor, Bahman Guyuron, M.D. In print. Ramirez, O.M. : Advanced Subperiosteal Facelift Techniques. "Aesthetic Facial Plastic Surgery: A Multi-disciplinary Approach". Editor, Thomas Romo, III & Arthur L. Millman, M.D. In print. Ramirez, O.M., Pozner, J.N. : Endoskopisches Face lifting. Plastische Chirurgie Klinik und Praxis. Ecomed, S. Krupp, editor, chapter V (in print). (Entrance No. 104 bibliography). Ramirez, O.M., Pozner, J.N. : "Endoforehead". Appleton & Lange. Gregory Evans, M.D, Editor. Chapter 18. In Print. (entrance Not 107 bibliography). Ramirez, O.M. : Manual of Anatomy for Pre University Students. Lima, Peru, 1975. Ramirez, O.M., Daniel, R.K.: Endoscopic Aesthetic Surgery (video manual). Springer Verlag New York, 1995. Ramirez, O.M., Daniel R.K.: Endoscopic Plastic & Aesthetic Surgery Textbook. Editor, Ramirez, O.M., Daniel, R.K. Springer Verlag New York, 1996. Ramirez, O.M. : Subperiosteal Face Lift. Editor Ramirez, O.M. Springer Verlag New York. In print.